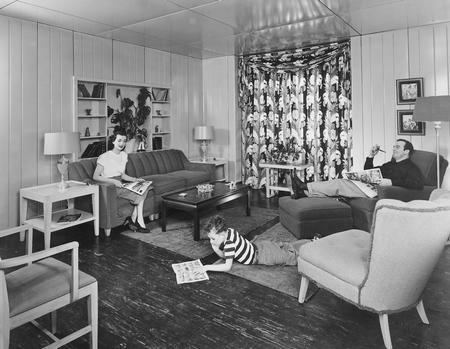 Family relaxing in the living room of a Lustron House, ca. 1947-1950. Lustron homes were prefabricated, single family homes constructed of porcelain steel. They were manufactured in Columbus, Ohio. Ohio Historical Society MSS 926 AV, AL01177 from the Neil Collins Papers Photograph Series Collection.